Louie’s mother, Louise is the novel’s embodiment of belief, giving the rest of her family the conviction that Louie was alive even after the army announced his death. Like Louie, she has a love of mischief and a defiant streak. A great cook, she is a supportive and loving mother who worries tremendously for her son. The timeline below shows where the character Louise Zamperini appears in Unbroken. The colored dots and icons indicate which themes are associated with that appearance. Plaue, Ethan. "Unbroken Characters: Louise Zamperini." LitCharts. LitCharts LLC, 21 Aug 2015. Web. 18 Apr 2019. Plaue, Ethan. 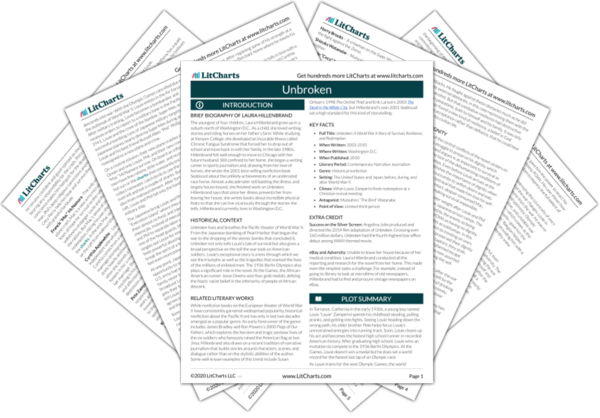 "Unbroken Characters: Louise Zamperini." LitCharts LLC, August 21, 2015. 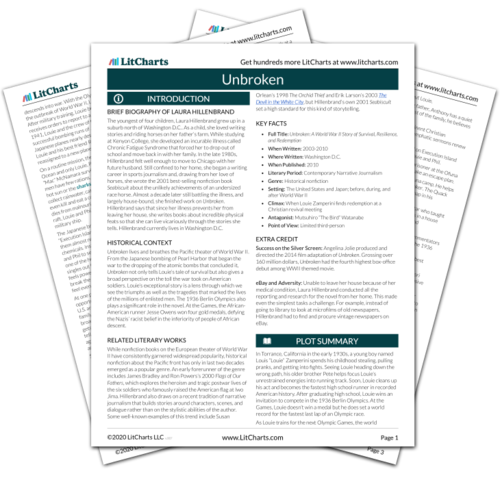 Retrieved April 18, 2019. https://www.litcharts.com/lit/unbroken/characters/louise-zamperini.